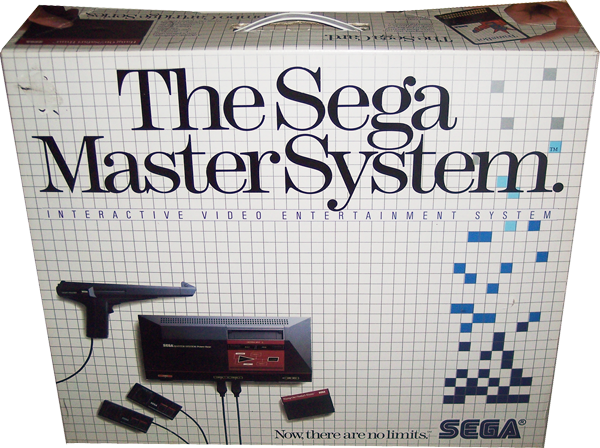 Aaah Yes, the SEGA Master System. 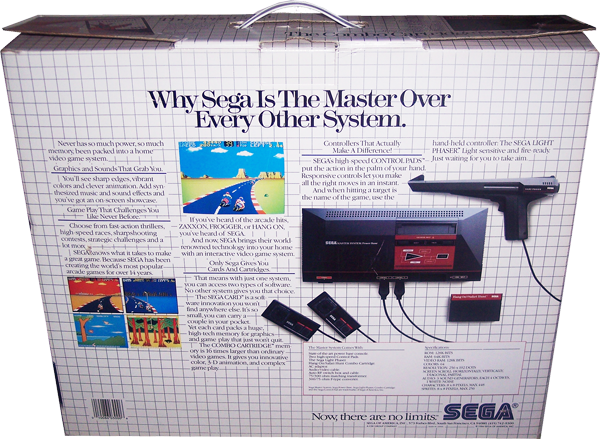 Released in the US in 1986, it was SEGA’s answer to the popular Nintendo Entertainment System. Better graphics and specs on the Master System still couldn’t take the lead from the NES with it’s vast library and Nintendo’s request that 3rd party developers keep games exclusive to the Nintendo. Still, the Master System did so well in Europe and Brazil that even after the release of the SEGA Genesis, SEGA continued making games in those regions. That’s why you can find the Sonic series, Streets of Rage and other Genesis titles available for the Master System online. And if the game is in NTSC (and not PAL) it will play on US systems with no problems. 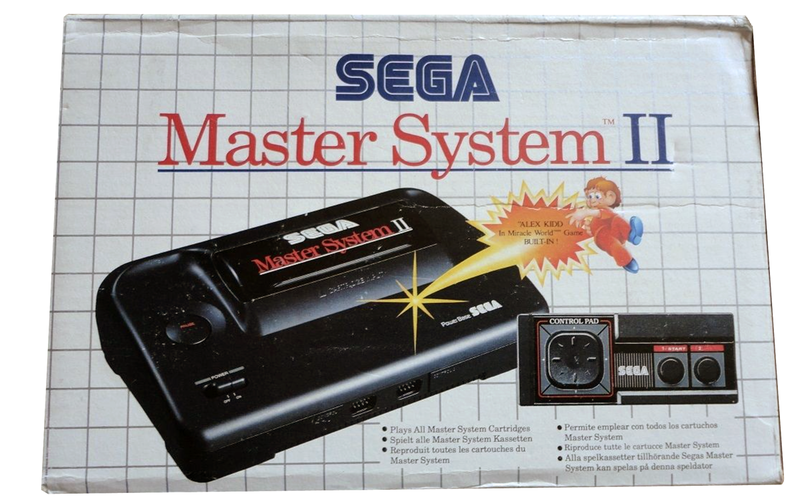 I was still playing my Coleco/ADAM at the time, when my sister’s boyfriend gave me his SEGA Master System. All he bought were RPG games. Phantasy Star, Golvellius & Miracle Warriors all landed in my house at the same time. And so began my unnatural love affair with SEGA. While there were no real cosmetic changes to the original SEGA Master System, there were many different pack-in configurations. I will list them out, but I have seen instances where the model number does not match the built-in game. 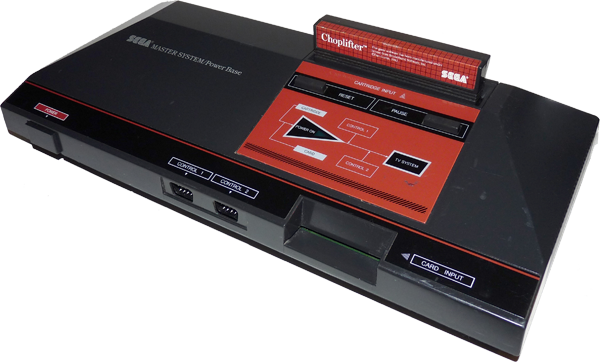 The Master System plays two different cartridge types: Your standard game cart on the top of the machine and a credit card sized version that were cheaper, smaller games. This credit card port also allowed you to plug in the great 3D Glasses add-on! 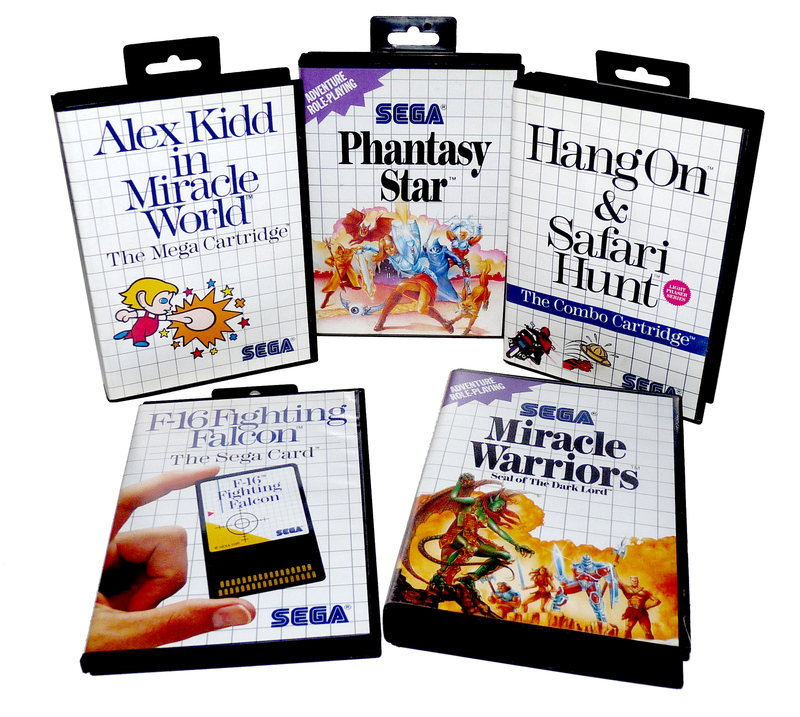 There were several different game combinations built into the SEGA Master System. If you look at the model number on the bottom you can (maybe) tell which game is installed in the unit. On the front of the machine you have a nice large power button which clicks in when on. There is a red LED power light that will shine when the system is on. You have two controller ports that use the same 9-pin controller plug like the Atari 2600, Colecovision and SEGA Genesis. To the right of the controller inputs is the Card Game slot. You slide the card in flat and it sticks out a little bit. On top is the standard cartridge slot, and RESET button and a PAUSE button. The RESET button will restart the game (losing the current game if you are playing). And the pause button will do exactly what you think it would do, pause the game. That’s right, you want to pause the game and answer the phone? You won’t be doing that from the controller. On the back of the SEGA Master System you have 4 ports. AV OUT: Used with the SEGA RCA Cable (red, white & yellow plugs). However the Master System did not output stereo sound, so many of the cables will have the one yellow cable for video and only have (and only need) one audio cable, red or white. It doesn’t matter the color, but you always plug it into the white port on your TV. NOTE: Most TV’s will recognize a single RCA cable plugged into the white input as a mono signal and automatically send the sound to both left and right speakers. CH3 CH4: This is used to pick the TV channel the game will display on when using the SEGA RF Switch Box instead of the SEGA RCA Cable. When using the RCA cable this switch doesn’t matter. RF OUT: This port is used for hooking the Master System up to your TV using SEGA RF Switch Box. This runs into the coaxial on the back of the TV, normally where your cable or satellite TV is plugged. This method gives you a lower quality picture than the RCA Cable and I would avoid it at all costs. AC ADAPTER: This is used with the SEGA MK-3025 Power Supply. Overall the SEGA Master System is a nice machine. I like the angular look of the system and have found them to be very durable. I have handled over 50 of these guys in my time and very few of them were broken and didn’t work. There are many great games for the system like the original Phantasy Star & R-Type along with the all the follow-up releases of popular SEGA Genesis titles like the Sonic series. It’s a fun system to collect. 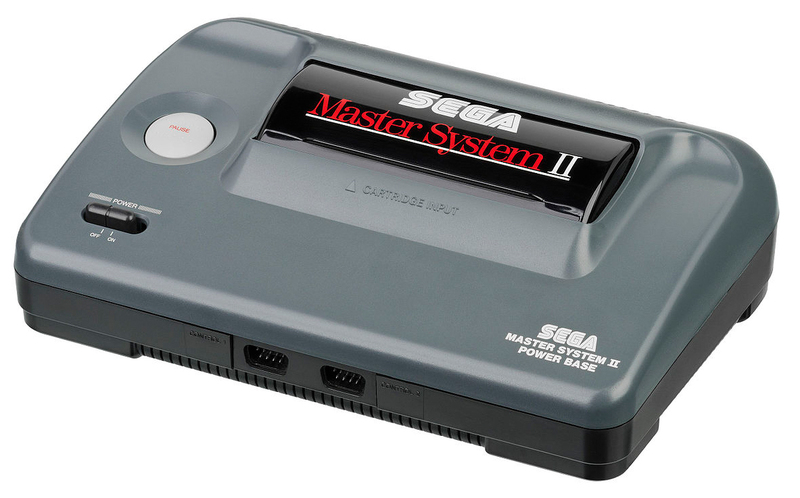 In 1990, Sega released the remodeled Master System II, designed to be a lower-cost version of the console. 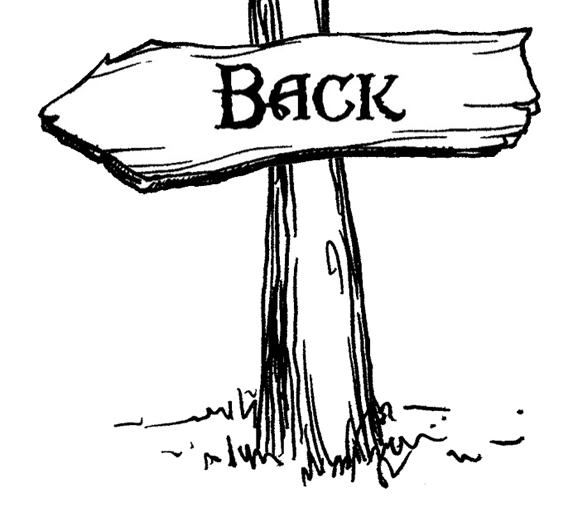 The was released at about the same time as SEGA’s brand new Genesis system. This model removed the card slot so no card games or 3D Glasses could be used with it. Everything else operates the same as the original. It came with Alex the Kid in Miracle World built-in. 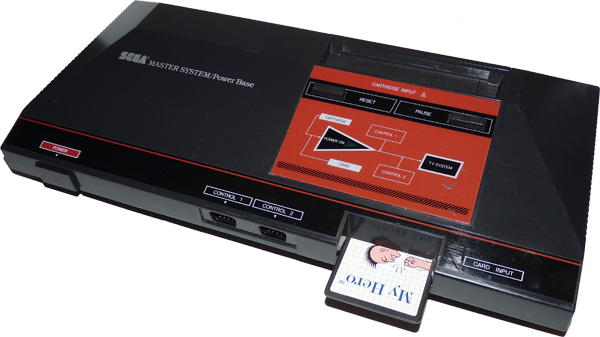 While in the US the Master System didn’t sell so well, it was a major hit in Europe and especially Brazil. That at least provided a lot more games to collect for the system due to continued game releases long after the Master System was dead in the US. This unit is harder to find and normally more expensive than the original model. So I would just stick with the original as you get the card functionality also. 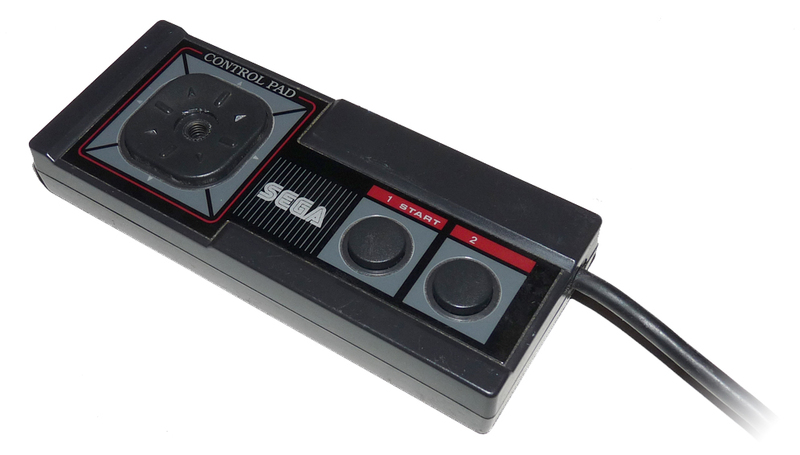 The SEGA Master System came with a 2-button controller very similar to the NES controller. It has your standard 8-way d-pad and an A and B button. Pretty straight forward. There are some different variations though that I have come across. On the early models the wire came out of the controller on the right side. This made it a bit awkward to hold as you would have the wire running between your fingers. They later moved the wire to the back like we are all used to. There are some controllers that have a small hole in the middle of the d-pad. If you look closely you will see there is a screw thread inside. This was used to screw in a tiny little knob that was about a 1/2″ tall. It has a little ball on the end and made the d-pad more like a little joystick… good luck finding those little guys. Much like the NES, the SEGA Master System often came with a gun pack-in. The Light Phaser is a nice light gun. The design is cool and like a laser gun. The trigger has a nice click and is responsive. The construction is nice and they also added a weight inside the handle so that it has some nice heavy feel to it. 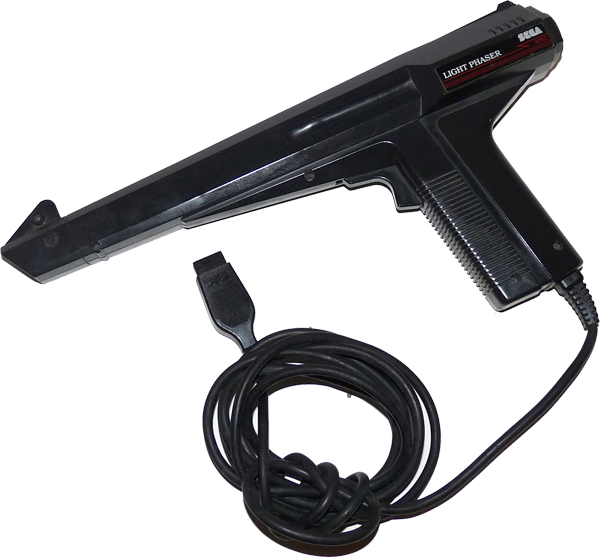 NOTE: This gun or any other light gun like the NES version WILL NOT work on new TVs. It will only work on old CRT TVs as it shoots electrons that the CRT screen detects. This effect is gone on LCD TVs or anything not a CRT. This is a good reason to get and keep an old reliable CRT TV for your game room! The SEGA Master Systems graphics were very nice for the time. In almost all cases if the same game was availble for the NES, the Master System version was superior. The Master Systems library has a good mix of game types. There are many gun games including ones that utilize the 3-D Glasses. There are some quality RPG’s, plenty of platformers, shumups, and action games. There is plenty here to keep any collector happy. 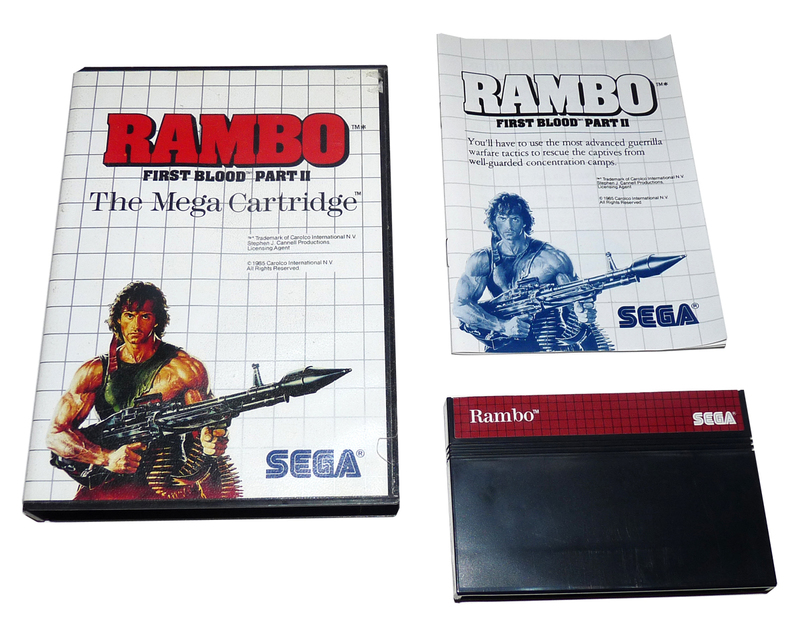 The games came in a sturdy plastic box, with clips inside that held the cartridge. There are normally tabs on the inside front that held the manual in place. These are the same style boxes that were later used for the SEGA Genesis. Being a plastic box these guys have held up pretty well. There is a clear mylar sleeve around the box that the game cover slips into. This allows the box art to hold up pretty well over time also. You can remove the game cover from the top or bottom of the box (opening the box gives a little slack to the mylar sleeve allowing you to reach in and pull out the cover). If yours is damaged you can even print your own cover and slide it in! Most of the manuals are in black and white with blue used for the cover. The box art design and manuals on most games has the same overall Master System grid lines with some small art that represented the game. It’s rare to see a game box with large game graphics, the ones that do are most likely from the 2nd running of Master System games that came out after the SEGA Genesis. 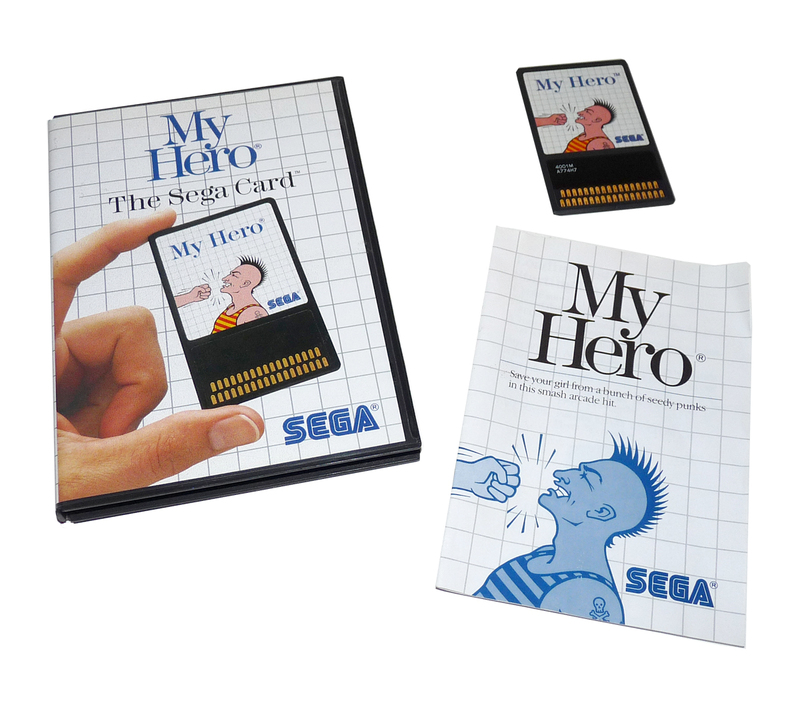 In addition to the standard cartridges the SEGA Master System also played smaller games from The SEGA Card. These are little credit card sized games. They are about 3 times thicker than a credit card though and quite sturdy. Their box was slightly smaller and much thinner then the standard Master System cases. The card itself came with a clear protective sleeve that slides over the entire card for storage.